Engineers and designers bullish on the wearables space have long touted helmets as a logical place to deliver real utility. Thus far, no single concept has been able to gain much traction. That could be set to change with Jarvish’s two new smart helmet releases set to debut over the coming year. The helmets, dubbed the Jarvish X and the Jarvish X-AR, respectively, will come equipped with a host of innovative features designed to improve the total experience of motorcycle riding. One of the trends Jarvish wants to capitalize on that would deliver more convenience to motorcycle riders is voice. 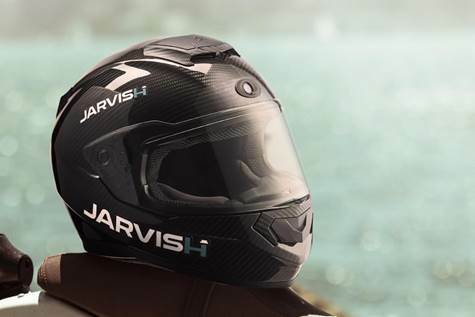 Featuring easy integration with Siri, Alexa and Google Assistant, the Jarvish X will enable motorcyclists to talk to their helmets to check everything from the weather to football scores. Riders will also be able to more easily communicate via talk and text without having to shift their focus away from the road. While safety and convenience are important, Jarvish is adding a few additional bells and whistles to make sure its helmets offer something fun for riders as well. A front-facing 2K camera will allow riders to record any particularly exciting parts of their trips. The carbon-fiber helmet will run on a battery charge that the company says should last up to six hours. Already on sale in Taiwan, the Jarvish X will hit Kickstarter later this year for U.S. buyers at $799. The Jarvish X-AR comes with all the same features as its more basic counterpart and then some. In addition to voice controls, the X-AR will leverage augmented reality to offer riders a heads-up display with all sorts of vital information. Current climate, speed and text-based navigation info. should overlay the wearer’s field of vision. In addition to the front-facing camera described for the X model, the X-AR will include a similarly positioned camera on the back of the helmet to act as a rearview mirror. This mirror feed will also appear in the HUD, allowing motorcyclists to better manage the risk of cars speeding up behind them too quickly. Made of the same carbon fiber as the X, the X-AR comes with a slight reduction in battery life due to its advanced display. It should still last for up to four hours. Still in the final stages of development, the X-AR won’t hit the market as soon as the X. By late next year, however, riders should be able to get their hands on the futuristic devices. At almost $2,600, they won’t come cheap. Jarvish, however, is banking on the notion that the utility of its new helmets will outweigh any objections to their price. For a look at how AR-enabled helmets could reshape more than just motorcycle riding, check out this article on how the technology is being put to use in the construction industry.